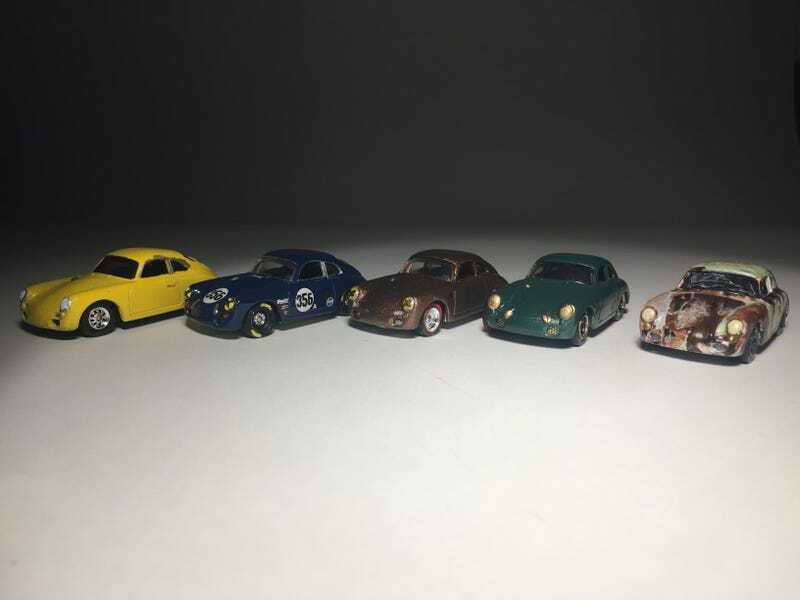 I have 5 356s in my collection. The middle 3 have been featured here before, but the other 2 are pretty cool. I’m not sure about the yellow one yet- it might get a Pegasus, but The wheels sit pretty far in, and the finish is awful, and I haven’t managed to get a good one at all. But the next one is a pretty cool Barnfind. I originally didn’t have plans for this- it has sizeable diecast nick in the front fender, and I didn’t notice it until I figured it would just be another member of the graveyard. Originally a Silver 356B, this 356 has been sitting in the backwoods behind an old barn for the greater part of its life. Last run in 1982, It has been slowly rotting away. The critters have made a habitat of its interior, ruining its black leather seats, and making the floor more feces then actual metal. Miraculously, the metalwork has managed to escape relatively unscathed- save a small portion of the front quater Panel that has rusted through. next up is this Bronze 510 Wagon. I thought about having it sit on different wheels, but these just look to good. Next up is a RX7, sitting pretty on some Kreauto wheels. I thought about using something else, but these wheels just fit it so well. Shame of it is, I have to order a whole pack just to get these 4! Also makes a great companion to my GTRs! Even if it’s blue is a significant part darker. I also have a beautiful Alfa Romeo Gulia, fit in traditional colors with a black and Gold, also sitting on Kre Auto wheels. Finally I have the first instance of me doing hand decals! I didn’t feel like waiting a month to get the decals, so I figured screw it. The Japanese on the back spells out apeedhunters, while the windshield has LB Works on it.